On our way to Laos, Jason and I had to stop over in the city of Chiang Rai. Chiang Mai’s sister city of the north. We didn’t spend much time there, so take our opinion with a grain of salt, but we weren’t completely stoked on it. But here is the thing, I would still recommend you go. My reasoning why is because it has my absolutely number one FAVORITE temple in all of Thailand! 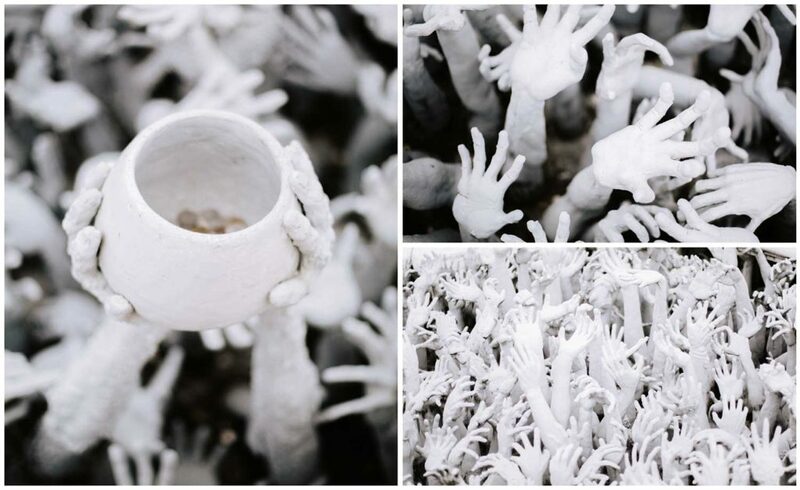 The White Temple, or Wat Rong Khun. The White Temple has a darker side. So at first glance, you may think like me… oh a white temple. Its white, it symbolizes purity, Nirvana, whatever, how symbolic (eye roll). Basically, I just imagined your typical Wat, but white. I was pretty Watted out at this point, and I was all about this place. It completely shocked me. I knew nothing about it going into it. I was presumptuous. Thought I had it figured out. But clearly, I was very wrong. Two Kinnaree post up at the entrance to the Temple. First of all, the Temple is not that old. It was opened to the public in 1997 by the artist Chalermchai Kositpipat and he still currently has several different buildings within the compound being designed. Many of the temples are traditional gold color, but the White Temple is truly unique. And that’s what it is, its like Hell, but I guess like Buddhist Hell. The bridge into the Temple is surrounded by a moat of hands grasping at you. They hold out jars for money, help, whatever desires they or you may have. In Buddhism, in order to reach Nirvana (aka inside the Temple) you need to be able to forgo all earthly desires and possessions. This is the path to enlightenment. Surrounding the bridge looks like something out of a horror movie. Eyeballs, tentacles, pure terror laced into a thorny hedge of demons. A hedge of demons lining the bridge. Once you cross the Bridge you are greeted by two guardians who represent Death and Rahu, the one who decides your fate. Once you gain entrance to the temple, the horrific imagery quickly de-escalates. Too many details to process. The exterior of the temple is so detailed, and ornate, and full of symbolism, but my favorite part of my tour was the interior. Unfortunately, they do not let you take pictures inside. 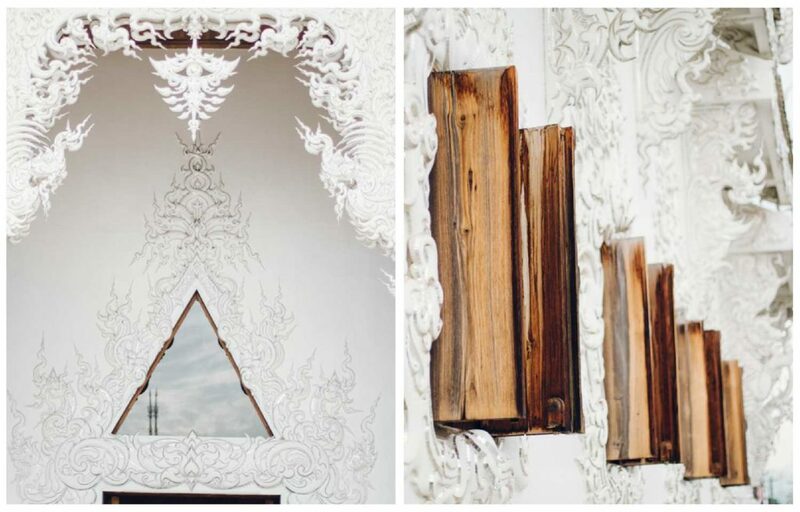 The entire inside is intricately painted in deeply symbolic Buddhist imagery, and yet littered with almost any and every pop culture image you could imagine. I can’t even describe the inside in a way that would do it justice, and just as well because you deserve to be taken by surprise and awe as I was. The White Temple was a highlight of Northern Thailand for me, so be sure you don’t miss it if you are passing through Chiang Mai. 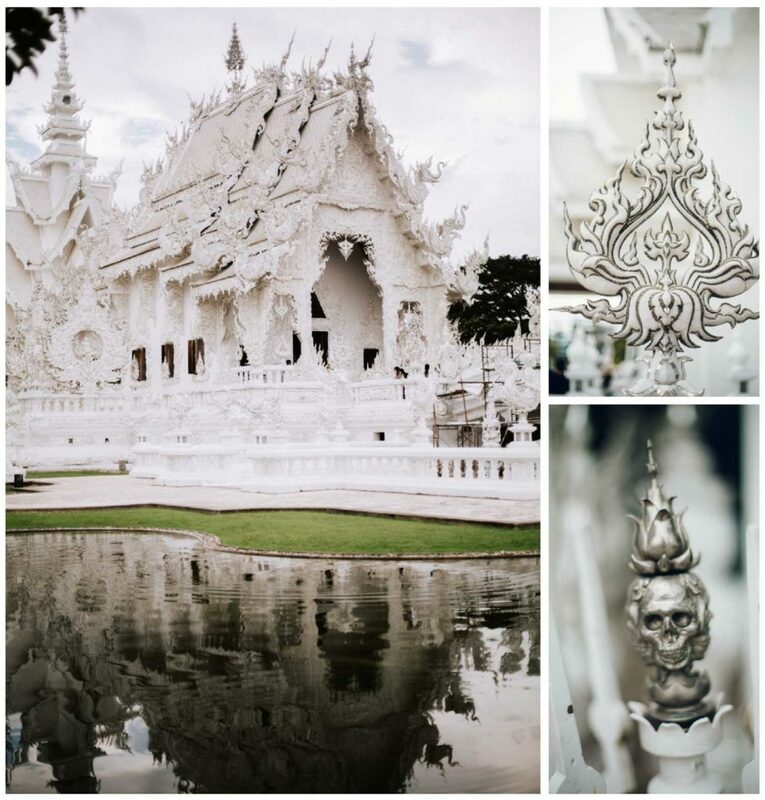 0 Comments on "The White Temple (Our FAVORITE) / Chiang Rai"